1.1 The same with all of us humans, iPhones dread the thought of extreme cold. It can just ignore your touches and eventually shut down. Read more about it. 1.2.5 On its website, Apple suggests that you only use your (4th generation or later) iPhone in environments between 32º and 95º F, since “low- or high-temperature conditions might temporarily shorten battery life or cause the device to alter its behavior to regulate its temperature. 1.3.2 To keep your iPhone warm, you can keep it close to your body and use a case. Also, stop checking your iPhone so much when you’re walking outside! 1.3.3 Toronto’s Global News recently ran an experiment to see how iPhones reacted to the cold. They took two iPhones of the same model and left one outside in the cold (where temps barely edged above zero Fahrenheit ) and took the other one inside. Thirty minutes later, the iPhone that was inside had gone from 100 percent battery life to 99 percent, while the one left in the cold had dropped to 86 percent from 100. When they tried to use the cold iPhone it shut off. 1.3.4 It’s not just the iPhone that struggles in the cold. Finland’s MikroPC tested 15 cell phones to see how they would fare in increasingly cold temperatures, and all of them eventually failed once they got cold enough. The first to stop working was the iPhone 4S, which died at 14 degrees. The Samsung Galaxy II lasted the longest, not shutting down until the temperature reached -31 degrees. The same with all of us humans, iPhones dread the thought of extreme cold. It can just ignore your touches and eventually shut down. Read more about it. On its website, Apple suggests that you only use your (4th generation or later) iPhone in environments between 32º and 95º F, since “low- or high-temperature conditions might temporarily shorten battery life or cause the device to alter its behavior to regulate its temperature. To keep your iPhone warm, you can keep it close to your body and use a case. Also, stop checking your iPhone so much when you’re walking outside! 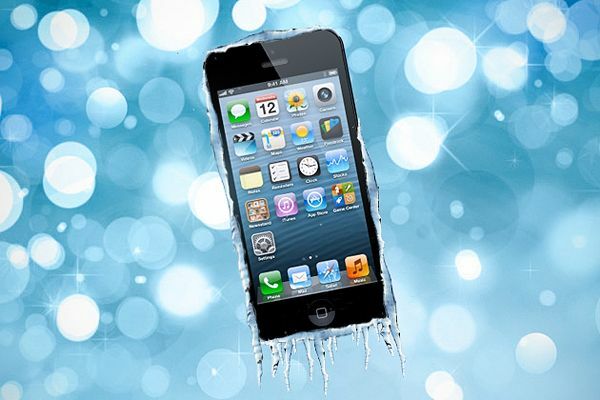 Toronto’s Global News recently ran an experiment to see how iPhones reacted to the cold. They took two iPhones of the same model and left one outside in the cold (where temps barely edged above zero Fahrenheit ) and took the other one inside. Thirty minutes later, the iPhone that was inside had gone from 100 percent battery life to 99 percent, while the one left in the cold had dropped to 86 percent from 100. When they tried to use the cold iPhone it shut off. It’s not just the iPhone that struggles in the cold. Finland’s MikroPC tested 15 cell phones to see how they would fare in increasingly cold temperatures, and all of them eventually failed once they got cold enough. The first to stop working was the iPhone 4S, which died at 14 degrees. The Samsung Galaxy II lasted the longest, not shutting down until the temperature reached -31 degrees.